Stories, race recaps, photos – even high-def nature documentaries – don't come close to actually experiencing Key West. If you're a sucker for architecture, you'll love Key West's quiet, narrow streets lined with charming homes. If you've rented a car, be ready for Google Maps to steer you wrong when it comes to the one-way drives. 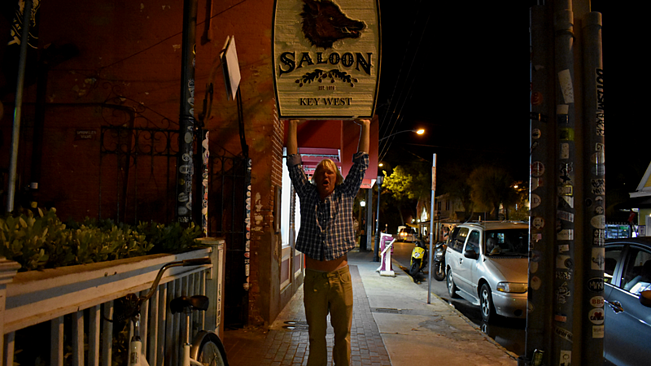 However – as most locals will tell you – you don't need a car in Key West as most of the town is walkable. Grab a cab from the airport for $20 and forgo the hassle and expense of parking. Key West maintains a steady breeze and sun throughout the winter months, and gets a bit balmier in April and May. My first day in town, the muggy and overcast weather finally broke, and it poured from morning to mid-afternoon. In Boston this would be considered a perfect day to grind out some work – except in the tropics, this thick cloud cover meant WiFi was out all over the island. More of that island charm! 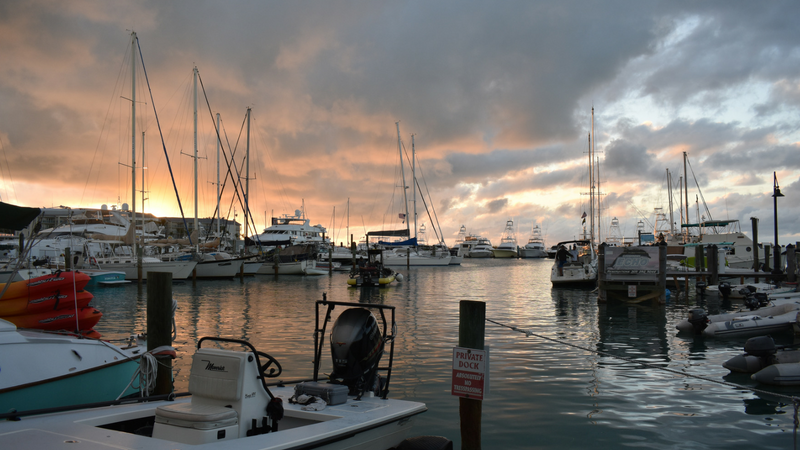 In addition to marinas such as the Conch Harbor Marina, A&B Docks, Galleon Marina, Key West Bight has a hopping nightlife scene. From the peanut butter beer at Waterfront Brewery to the live music and Conch-Blowing Contest at Conch Republic, you can easily make a night out of visiting this one neighborhood. Get dinner at The Commodore's Boathouse Bar & Grill and a drink at Schooner's Wharf, and you'll be ready for a dose of hair of the dog in the morning. And then there's Duval Street. A short walk from Key West Bight and referred to as the equivalent to New Orlean's Bourbon Street, a walk down Duval reminds you that Key West (or its tourists, at least) can party. We popped into Rick's, Irish Kevin's Pub, Sloppy Joe's Bar, and Hog's Breath. Most notably was the sidewalk outside Sloppy Joe's (avoid breathing through your nose) and the killer live music at Hog's Breath that got the crowd dancing. Whether you're there to people watch or contribute to the raucous scene, keep in mind that Duval Street and its bars are lined with live webcams – so tell the friends at home or take that intel to the grave. Taking a boat off the "mainland" for a couple hours gave me a much better appreciation for Key West. We were off the charter boat dock in Garrison Bight at noon and in Boca Grande around 1pm. Leaving Garrison Bight with the City Moorings on starboard, we took it slow through Fleming Key Cut and pulled into the fuel dock at Conch Harbor Marina in Key West Bight. Exiting the harbor, we split the uprights between Sunset Key and Wisteria Island. A stark contrast, Sunset Key's shores are lined with multi-million dollar homes (I'm told one is Lady Gaga's), and Wisteria Island is apparently still under dispute as to ownership, so is currently inhabited by nomads camping. Around Wisteria is also a safe anchorage with more than 50 boats. The ride west to Boca Grande is a smooth one – the 6 miles of flats have certainly earned their name. Sailors will be grateful they have a dinghy aboard so they can anchor further out and still explore the islands surrounded by 4-foot deep waters. 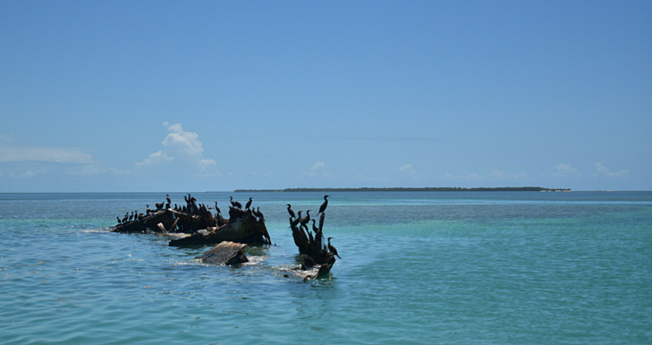 Keep an eye out for the wreckage en route – it's highly visible, but slow down and watch for interesting ocean life. If you're in for a beach day, don't set up shop too close to the water, as boaters new to the area don't realize the wake they throw. The current off Boca Grande is fast – keep an eye on your swimmers. The water is crystal clear, cool, and calm, but it's unadvisable to swim off the main beach due to the occasional shark. Instead head down the beach to the mangroves, make your way through the bramble or around the outside through the 2-foot deep water, and swim in the small cove with the rope swing. 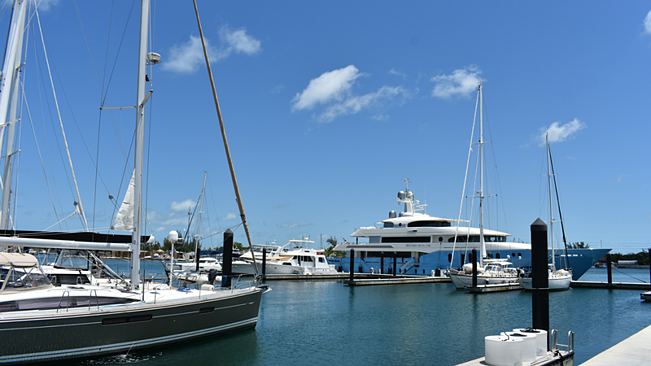 While on Key West I had a chance to visit Stock Island Marina Village, pictured above. This marina truly has it all – first and foremost, the welcoming and knowledgeable staff. The amenities go far above and beyond, from the spacious new floating docks, 450' fuel dock, captain's lounge, gym, a community garden, and (my personal favorite) the most dog-friendly atmosphere of any marina I've visited. Their new on-site hotel – which is stunning in its own right – brings with it indoor and outdoor restaurants and bars, and from what I sampled diners will be highly impressed. 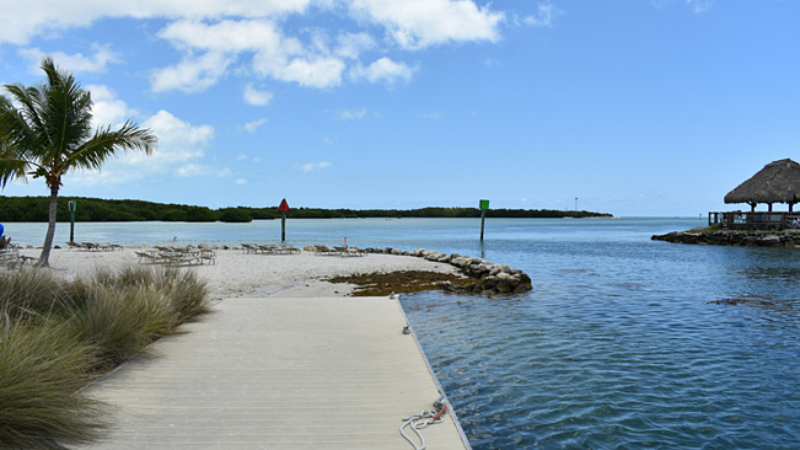 In the past Stock Island hasn't been considered as desirable as main Key West, but that is quickly changing and Stock Island Marina Village is well ahead of the trend. Key West Harbour, a few minutes east, is located on the beautiful Boca flats with quick access to the open ocean to the south. With an on-site pool, restaurant, and white sand beach, this is another great choice for boaters tying up on Key West. Stay tuned for more (subscribe to the blog with the form below) on Stock Island Marina Village, Faro Blanco Resort & Yacht Club in Marathon (here's a quick preview), and Key Largo up next! 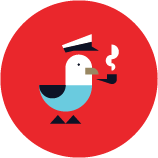 Meanwhile follow Dockwa on Facebook, Instagram, Twitter, and (new!) SnapChat for photos and video of this roadtrip visiting marinas up the east coast. While you're at it, follow Marinas.com too, so you don't miss out on any marinas: Facebook, Instagram, SnapChat, and Twitter.